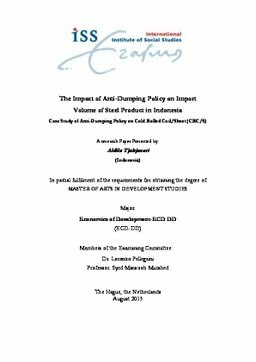 The present research study investigates the impact of anti-dumping policy on import volume of steel product in Indonesia specifically on Cold Rolled Coil/Sheet (CRC/S) using time series monthly data from January 2008 until March 2015. This study compare the impact of anti-dumping policy on two cluster countries namely ‘named countries’ as the country who become the subject of anti-dumping policy and ‘non-named countries’ who become non-subject of this policy. This research also employs two main research methods such as econometric method as well as descriptive analysis method. In addition, the variables namely duty, market share and dummy dumping period are the key variables to examine the trade restriction effect and trade diversion effect of anti-dumping policy. Several empirical studies have addressed the impact of anti-dumping policy in developing country. However, this research focuses to investigate specific product in steel industry namely CRC/S which is the newest dumping case in Indonesia. The empirical result shows that anti-dumping policy has negative significance to the import volume of Cold Rolled Coil/Sheet (CRC/S) from 5 (five) ‘named countries’ namely Japan, China, South Korea, Taiwan and Vietnam, while it has found positive significance to the increase in the import volume from ‘non-named countries’. The descriptive analysis method shows that both trade restriction effect as well as trade diversion effect proven from ‘named’ to ‘non-named countries’.